The US men's national team played their first game under new head coach Gregg Berhalter on Sunday night, and they won convincingly. They didn't exactly blow a young Panama team off the field, but they got on the ball early, stayed on it often, and used it throughout to both set the tempo of the game and dictate where it would be played. In Berhalter's words, the game provided "a good baseline," and "enough content to work with" going forward. My colleague Charlie Boehm wrote a bunch about that after the game. It was Step 1 in taking a collection of mostly young, mostly unproven talent and weaving their collective skillsets together into a coherent whole. Nothing about what we saw was or is a finished product. EPL junkies caught onto this wrinkle almost immediately. There are many, many many professional coaches who don't like to talk about formations because they feel like it's too simplistic and too ripe for misinterpretation. There are many, many many fans who mistake "formations" for "tactics." The two work in tandem, but are not the same thing. What coaches – especially those with a tactical bent, like Berhalter – really like to talk about are shape and function. And the shape of the US on Sunday was a 4-4-2 defensively that morphed into kind of a 3-3-4, or maybe a 3-2-4-1 when they had the ball. Credit to @finalthird for these screenshots and the observation. Go give him a follow. As he pointed out and as I'll emphasize here: There is a difference between doing this against Panama's B team and doing it against Liverpool, and taking one part of Man City's structure does not mean that the US played like Man City in terms of either quality or every aspect of their tactical approach. But a big foundational piece is very, very similar, and that's useful if we're going to really understand what Berhalter's trying to build. Anyway, it's fair to assume that Berhalter's pulling his influences from more than just what he saw in MLS, and more than what he learned while playing in the Netherlands and Germany back in the day. By all accounts he has a voracious appetite for film and was never shy about experimenting with top-end stuff when coaching the Columbus Crew. Yes, those teams primarily played a specific way out of a specific formation (4-2-3-1), but there were some 3-6-1s and some 3-4-3s and some 5-4-1s thrown in at times. And they were thrown in with purpose. As was Sunday's tactical wrinkle. Functionally speaking, the idea is to get on the ball a lot, and to do so in dangerous positions without compromising defensive shape. That largely worked – the US had 66 percent possession and generated 17 shots. After a tentative start (they had only two shots in the first 20 minutes), the US found their feet and started to dominate. How they did that is what was interesting, and it goes back to the above observations re: Man City. We all know what a "modern, attacking fullback" is supposed to be, functionally speaking. 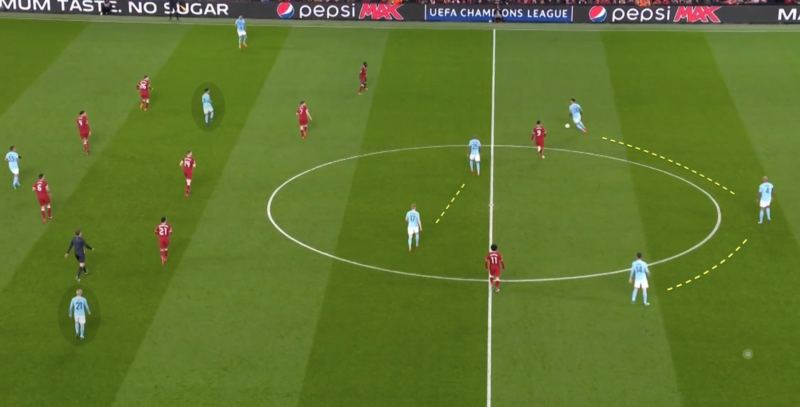 It's basically "get down the line, provide width and penetration, maybe a little bit of service and combo play, and try to draw defenders away from the actual attackers." That's Lima busting up the gut, looking off the defenders and making the play that led to the game's opening goal. Notice that neither Bradley nor the three other defenders (Daniel Lovitz, Aaron Long, Walker Zimmerman) are going anywhere. Notice that Cristian Roldan – who won the ball at the start of the play – has a free midfield central midfield role that functioned more defensively, while Djordje Mihailovic nominally had the same midfield role, but functioned more as a pure attacker. Notice that Corey Baird, the right winger, is getting chalk on his boots, while Jeremy Ebobisse, the left winger, spent much of his time on the field tucked in much tighter. 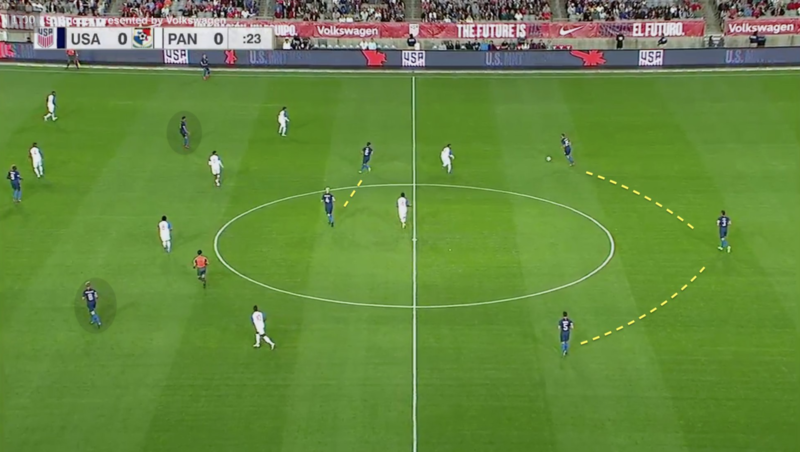 This is a shape the US have never used before, and it creates interesting potential for combination play. It specifically asked a lot of Lima, who certainly never had anything close to that function while playing for the San Jose Earthquakes. The only other team I can think of that does something similar is Man City, who often uses Delph as a LB in the 442 when defending and then a center mid when they are in possession. He really did. Panama didn't really generate much going down the US right-hand side, and that's at least one useful data point to suggest something worked. The US also always had numbers around the ball in central midfield, which is a pleasant change – remember how badly Trinidad & Tobago overran the US midfield when Bradley was left to play 1-v-4 in that spot? Yeah. Not gonna see the numbers game get lost there too often anymore. If there was one area in which the US struggled – particularly for the first 25 minutes – it was with the timing and daring of their passing. Basically only Bradley and Zimmerman were hitting third-line passes that split defenders and advanced the ball into meaningful spots. This isn't necessarily because the US don't have good passers of the ball, but because it takes more than just one person to complete a pass. Not only do you need the guy receiving the ball to check into space between the lines at the right time, you need a teammate to run into space behind the backline at the right time. This game at the highest level is, to a good degree, choreographed. More than anything else, I'm really excited to see how this aspect of Berhalter's USMNT grows from game-to-game, camp-to-camp. Seventeen players got on the field for the US, and only one – Ebobisse, who's a center forward that was miscast as a left winger – was played out of position. Something as simple as that can make a world of difference in terms of both individual performance (remember when Wil Trapp got his USMNT debut as a left wingback in a 3-5-2?) and overall team performance. It also makes data points more meaningful when trying to spin forward and figure out what the team can or should look like when the games count. Two subs took particular advantage of this: Sebastian Lletget, who came on at attacking midfield for Mihailovic, and Jonathan Lewis, who came on at left wing for Ebobisse. Both guys added an element of on-the-ball verve that had been missing from the starters, and none of the original attacking quartet are effective dribblers. That's not exactly Lionel Messi-type stuff, but it's also not exactly what US fans have seen from US wingers – aside from Christian Pulisic – much at all. Part of being in a comfort zone is understanding "hey, when I have a defender out in isolation, I can go at him." Lewis was put in a position to leave his mark on the game, and he did so. Almost everyone else can say the same, to one degree or another. • There were fewer big switches from the defensive midfielder to the flanks than we were used to seeing of Berhalter's Crew teams. This is probably because of the shape change – with Lovitz not pushing high early in the play, and with Lima tucking in, the US were more about using width in the attacking third rather than in the midfield. • Mihailovic is really smart off the ball, but still struggles to complete the game-breaking passes I'd expect of a No. 10. • Zimmerman got over-aggressive once with his distribution and put the US in a bad spot. But man, his growth in that aspect of the game has been massive over the past three years. He was a legitimate weapon. Lewis needed to do better there, but that should give you an idea of what Berhalter is looking for from his 'keeper. • Just for the record: This is the biggest US win in a January camp game since a 5-0 win over Norway back in 2006. It's only the third time they've won by multiple goals this decade, out of 14 games. • Here's a question: If the US keep this system, where do Pulisic, Weston McKennie, Tyler Adams, Tim Weah and Josh Sargent all play? I have some theories on that myself – as does Taylor Twellman, who talked about Adams specifically on the broadcast – but am interested in seeing what you all come up with. Have a shout in the comments below. I'll peek in from time to time.